Tents in the woods off of I-293 in Manchester, New Hampshire. In the last few years, towns around New England have passed and enforced laws meant to keep people who are homeless moving away from certain neighborhoods and businesses. Photo by Ryan Caron King for NENC. One cold night late in November, Hartford police officers Joe Walsh and K9 officer Alfredo Pizarro called in a 10-27, a community service call, from Bushnell Park. Their K9 dog, Hundo, had sniffed out an 8-year old boy who was spending his second night sleeping outside with his mother, Haley Robbins, and her husband, Jonathan Nunez. Robbins, who asked that her son’s name not be used, was a security deposit shy of a city apartment. While she raised more money, she said she couldn’t find berth in a homeless shelter, and so she’d bedded her family in a corner of the park’s band shell, beneath what her son called the Princess Castle, the state’s ornate capitol that crowns a hill overlooking the park. When the officers approached the family, the boy began crying. He feared being separated from his mother. Though it is not the policy of the state’s Department of Children and Families to remove a child from a family because of poverty, the boy feared he’d enter the state’s foster care system, and lose contact with his mother. It’s not such a far-fetched idea. New England has always had laws that penalize extreme poverty, from complex colonial “warning out” rules that allowed town leaders to expel from villages people who were poor – supposedly so those people could return to their home towns for relief. There was no centralized welfare system. Relief was provided by local taxes. No town wanted to take on the undue burden of a neighboring town’s poor. Laws have changed, but attitudes haven’t. In the last few years, towns around New England have passed (and enforced) laws meant to keep people who are homeless moving away from certain neighborhoods and businesses. Business owners worry that the presence of loiterers will scare off customers. Pedestrians and shoppers don’t want to be asked to donate change. As with warning out, laws keep poor people moving…but to where? On the surface, laws against panhandling and loitering help reduce blight, but ordinances do precisely nothing to counter homelessness, and a new Yale study says they can send people who are homeless even deeper into abject poverty. Fines and imprisonment can mean loss of a space at a shelter, and loss of employment. 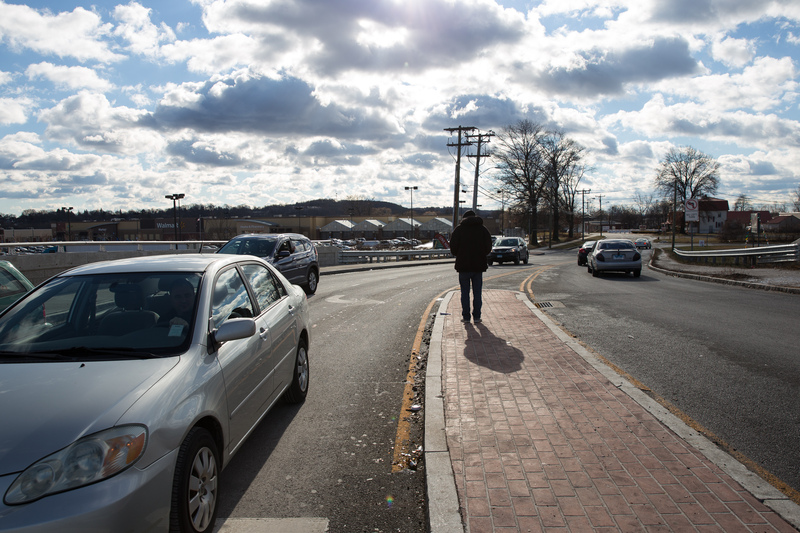 In November, students at Yale Law School’s Allard K. Lowenstein International Human Rights Clinic released a report, “Forced Into Breaking the Law,” that examined ordinances in 38 cities around Connecticut. Of the towns they studied, 24 prohibit loitering. Twelve prohibit panhandling. Arresting people who are homeless is a costly enterprise that can put a person on a devastating spiral into deeper poverty. If someone is charged a fine for loitering, they must appear in court, but if they don’t have a fixed address, they may not receive the notice to let them know they need to appear. They’re then charged with failure to appear, which means that they next time they come into contact with the police, there is a warrant out for their arrest. Meanwhile, if they’re arrested and spend time in jail, they lose their spot in a shelter, and perhaps lose whatever work they have, said Allison Frankel, of Marblehead, Mass., another of the study’s co-authors. The issues goes beyond New England’s borders. Recently, the National Law Center on Homelessness and Poverty released a report, “Housing Not Handcuffs” that looked at 187 cities around the country, and found that criminalization of homelessness is rampant. The report said even with a lack of affordable housing and shelter for people who are homeless, half of the cities surveyed prohibit camping in certain public places. 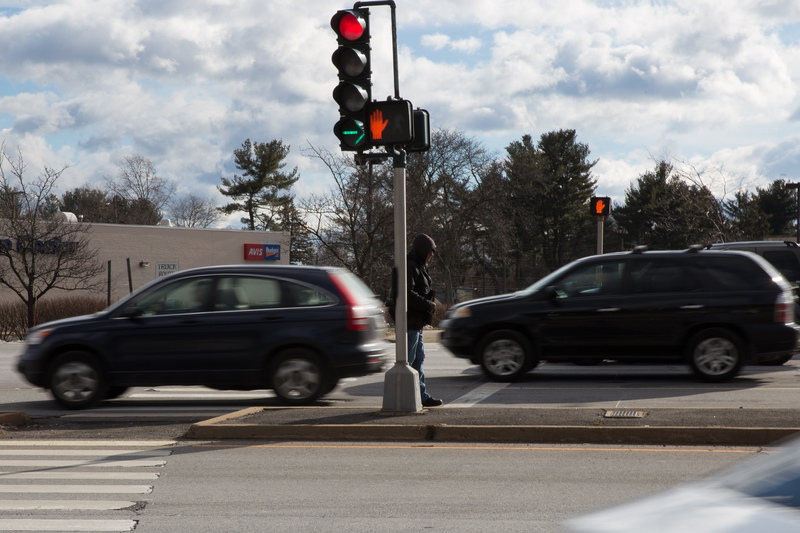 Nearly half (47 percent) prohibit sitting or lying down in public, 61 percent prohibit panhandling in public places, and 39 percent prohibit living in vehicles. A man panhandling outside of a shopping complex in Hartford, Connecticut. Photo by Ryan Caron King for NENC. Generally, police get involved when someone calls attention to someone sleeping outside, or someone asking for money. 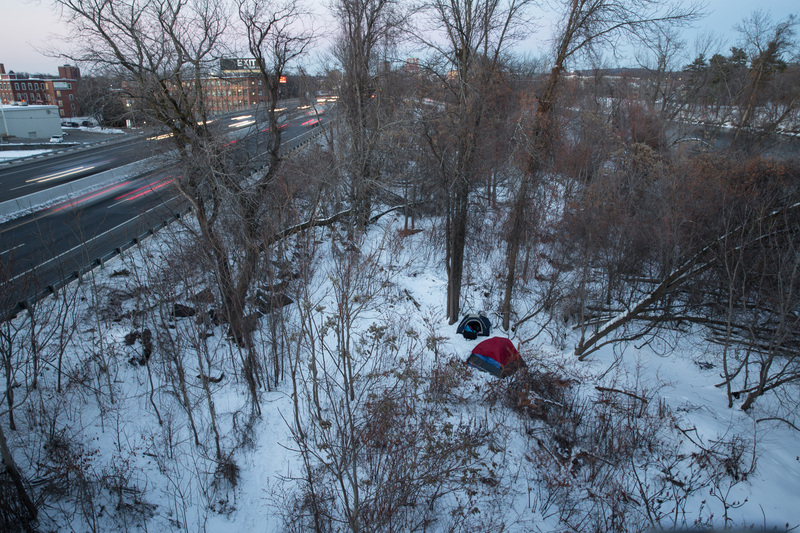 After neighbors complained, officials in New Haven announced recently they would raze a small tent city by I-91. While outreach workers struggled to find homes for the dozen or so people who’d taken up in the makeshift settlement, a few holdouts refused to come indoors and get supportive services. In August, police in Portland, Maine, did the same thing at a similar encampment. Trained police officers know that already, and they are often the first line of defense for people who are homeless. When Robbins’ 8-year old son began crying, the officers were quick to reassure him that he would stay with his mother. “You’ve fine It’s OK. You’re safe. Don’t worry about it,” the mother said the officers told her son. And then the officers began calling – a motel, a nearby fire station, anywhere they could find a place for the family, Robbins said. When there was no space available, the officers promised they would check on the family through the night. They also brought them food. 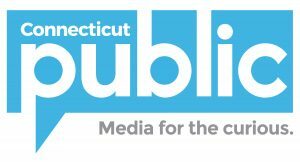 Early that next morning, Dave Duverger, who runs the Hartford homeless outreach team at the South Park Inn shelter, came by on his weekly rounds, and told the 35-year old mother there was a space for her family. Robbins cried the night she sat in the shelter hallway and told her story. Staying out of the judicial system can make all the difference for a family on the financial edge. Just before Christmas, Robbins and her husband got enough money together, and when she went to the landlord, he said, “Merry Christmas,” and forgave her a month’s rent in her new North End two-bedroom apartment with a big country kitchen. Robbins and her family spent Christmas at home. Now, stably housed, she takes her son to school and they pass the Princess Castle. Robbins has tried to explain to her son that no princesses live there, that that’s where the governor works, but the boy is adamant. Princesses live there, he insists. And they – along with some of Hartford’s finest – watched over his family.